See how significant is the role of the ROCOR in the end times. This is why the Mystery of Iniquity works so hard to destroy the ROCOR. All those who support the R-schisms participate with the antichrist. My dear brothers and sisters, please allow me to convey to you a very important message since we, together with the members of our brotherhood will live under the authority of our beloved Patriarch Irenaios, a true martyr of our time. Through me, the unworthy one nun Photini, the Patriarch would like to send you his blessings and his prayers. At the same time he also asks that you may remember him in your prayers, reminding us all that we do now indeed live in the last, and the coming of Antichrist is now to be expected at any time. What is happening in your country, Russia, are unquestionably very difficult trials, and, how should I say it, what is happening over there will lead to the complete destruction of the Orthodox Faith. Who could withstand, resist this I don’t know. As it is written in the Apocalypse: as Christianity started in catacombs, so it will also end, in catacombs. Let me bring to your attention some historical facts regarding the current patriarch in Russia, whose name I will not mention again now, you know who he is very well. Here’s what happened here: in 2007 the two Churches united. On 17 May 2007, the two Churches, the Russian Orthodox Church in Exile (ROCOR) and the Patriarchate of Moscow, joined together and celebrated this important event. And this promise he continually tries to fulfill. But the second most important thing is this: in 2004 in the Gorny Monastery (Mount Monastery) began to build a church dedicated to All Russian Saints. In 2007 the church was completed and was awaiting to be sanctified, and on August 29, when Kiril came, he consecrated the church to the memory of All Russian Saints. A few years after his departure, in 2009 an order was given to have a small cave uncovered in honor of Saint John the Baptist, who is said to had lived in during his earlier years. 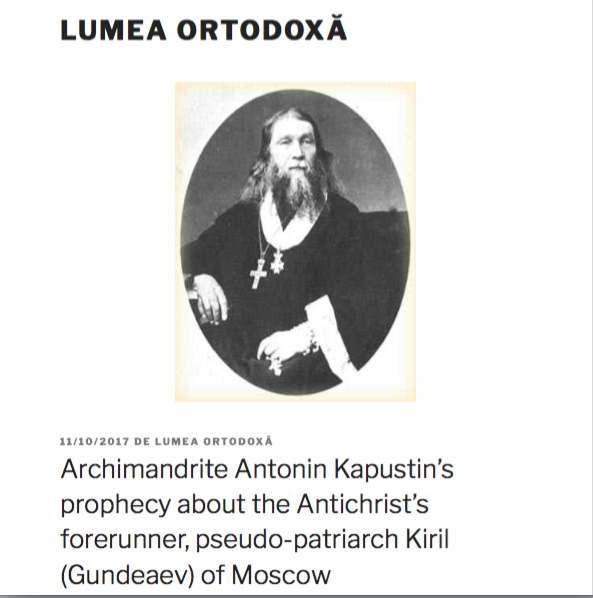 When excavations began, they came accross the archive of Antonin Kapustin (archimandrite, 1817-1894). It seems that when Khrushchev sold all the estates, the archive was hidden, being buried in this cave, but with this occassion the archive was found, uncovering a priceless treasure. To me, the sinner (mother Photini), was given the opportunity to witness and examine this archive personally. I’ve read this archive and in there it was written the following: „I, Archimandrite Antonin Kapustin, while working on the foundation of the upper church from Gorny Monastery dedicated to the memory of all the Saints, I had a terrible vision that I would not be able to complete it, but that it will only be completed right before the coming of the Antichrist and will be sanctified by the Forerunner of the Antichrist. The Monastery was sanctified, of course, by Kiril and Mark of Berlin, the betrayer of the Church in Exile. Here it is, here’s the living proof. I begged them (the sisters of the monastery) to give this archive to me for safekeeping, arguing that as a member of ROCOR and foreigner to this land it will somehow be better protected as they would not dare do anything to me, but the sisters obviously did not consider it appropriate to entrust it to me. They believed that they should hand it over to the Abbess and then further on to others so that many would find the truth and be saved, but they were all miserably deceived. These are not the times when the spread of Orthodoxy works like that anymore, but the time that leads to perdition. The archive dissapeared and all the sisters who have read it have perished, except for me the last one. They all believed that nobody would listen to me anyway being a foreigner, but they were mistaken. I believe that God will still look in someone’s soul and somebody will understand what is happening today, will listen these words. So you are running, and by running you are doing the right thing, in the catacombs is our only salvation. Remember our imprisoned Patriarch (Irenaios) in your prayers, the martyr of our times. God is still preserving him for a purpose. I still hope and pray that he may be our last hope and light until the very end. May Christ save you all! May the Mother of God be always with you, forever and ever. Amen!